Do you work for a Government contractor firm and get paid late? Comments Off on Do you work for a Government contractor firm and get paid late? I recently came across this news article about firms contracting on behalf of the government. Government contractor companies are meant to pay their suppliers within 30 days. If not they are in breach of their terms. Mark Prisk, the government’s Small Business spokesman is calling for those that are paid late to name and shame these firms. I expect there are thousands of individuals contractors working for companies that are fulfilling government contracts but are continually paid late. If you want to take up Mr Prisks’ offer to name and shame you can contact him here. Although all companies are required to file accounts with Companies House, small companies need only file abbreviated accounts that often comprise nothing more than a simplified balance sheet. This post covers a few tricks to get the most from this limited information, which I picked up screening potential acquisition targets for clients. Bear in mind that these are only estimation techniques and should never be relied too heavily upon. The profit and loss reserve includes all the accumulated profits of the business to date that have not yet been distributed to shareholders in the form of dividends. Therefore these accounts tell us that the business made profits of at least £3,924 (£14,363 – £10,439) in 2011 plus whatever dividend was taken out. Sometimes a note to the accounts will say the amount of dividend taken. If, for example, a dividend of £40,000 was taken then we would know with a high degree of confidence that the company made profits of £43,924 during the year. The opposite applies if the profit and loss reserve decreases year on year. 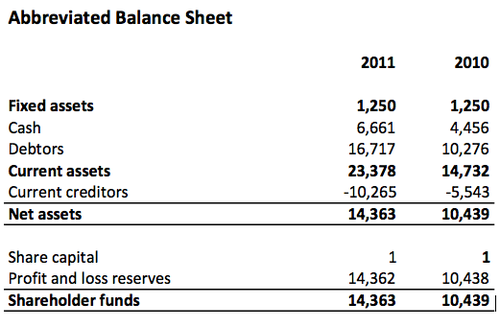 Let’s assume that there was a negative reserve of £5,456 in 2010 and £10,535 in 2011 (not unusual for a startup). We can mine quite a bit of information from this. First we know that over the lifetime of the businesses the losses to date have totaled £5,456. We also know that because a loss making company can’t take a dividend the actual loss in 2011 was £5,079. We know that when the accounts were drawn up there were debtors of £16,717. Broadly this means that customers owe the business this amount of money. If you are looking at the accounts of a company in a similar industry to you, you can probably assume they give broadly similar payment terms to customers. Perhaps you allow all customers to pay in 30 days but they actually pay in 45 days. This would mean that £16,717 represents 45 days worth of sales. A bit of maths (£16,717 / 45 * 365) tells us that annual sales are about £135,593. When doing this beware the impact that cash sales (not included in debtors) or seasonal sales (the debtors might reflect an unusually busy time of year) could have! We already think £16,717 represents 45 days of sales, if the equivalent debtors for 2010 of £10,276 also representds 45 days of sales then we can work out a growth rate. These accounts suggest that sales have grown an impressive 63% year on year. The creditors number should tell us the amount of money due to suppliers of the company (though it may also include loans). If we also assume suppliers are paid on 45 day terms then the company earns a profit margin of 39% (sales of £135,593 – expenses of £83,260 = profit of £52,333. Then £52,333 / £135,592 * 100). Note that this gave us another idea of the profits earned. Perhaps a dividend of more than £40,000 was taken? If all this is correct then profit margins decreased year on year (from 46% in 2010), which could be because the company reduced prices to increase sale volume. Annual Investment Allowance set to decrease – Spend money now! Comments Off on Annual Investment Allowance set to decrease – Spend money now! The Annual Investment Allowance is a tax break that began in 2008. It allows businesses to claim an immediate tax deduction for expenditure incurred on most types of fixed assets (cars are the most notable exclusion). Without the Annual Investment Allowance it is normal to have to spread the tax deduction attributable to the asset over its life, so the AIA is a nice way to bring forward a tax deduction (it doesn’t impact the total deduction available over the life of the asset). From 1 April 2012 the Annual Investment Allowance is set to decrease from £100,000 per annum to just £25,000 per annum. Period 1: 1st January 2012 to 31 March 2012 – 3 months under £100,000 equating to £25,000. If you spend £30,000 in period 2 you will only be able to claim a maximum of £18,750 for that period, if there is no spending in period 1 then this allowance will go to waste. Similarly if you spend £30,000 in period 1 you will only be able to claim a maximum of £25,000 for that period and unless there is additional spending in period 2 the £18,750 allowed will go to waste. Effectively you have two financial periods and are unable to transfer the allowance from one period to another. Should you bring forward capital expenditure? If you are anticipating to invest a sizeable amount of money in plant and machinery this year you should try to time your investments to maximise the tax saving in both periods. This might mean you want to bring forward planned capital expenditure into the first quarter of the year or delay some expenditure to after 31 March. I appreciate this isn’t always practical but the tax saving might make it worthwhile. HMRC are soon to being what they call their e-marketplaces campaign. This is aimed at those who are using eBay or similar services to trade online and are doing so in a way that HMRC construes as a trade or a business. The campaign begins on the 14th March 2012. Question 1. How, and why, did you get the things you’re selling? Answer A: you bought them so you could sell them again to try to make a profit. Answer B: you’re selling personal possessions you don’t want anymore, or things given to you or inherited. Question 2. How often do you sell things? Answer A: you make regular sales. Answer B: you have only ever made one sale and you don’t think you will make any more. Question 3. How do you sell? Answer A: by registering as a business seller or as an online shop with an internet auction site. Answer B: when you have something you want to sell you advertise it, but you don’t sell enough to make it worth setting up as a business user or shop. Question 4. Do you change or improve the things you’re selling? Answer A: you mend or change the things you buy (that might include splitting things up into smaller quantities), so you can make more profit on them. Answer B: you sell things as they are because you just want to sell them quickly. Question 5. How quickly do you sell things? Answer A: you sell things that you’ve only just bought and you’re hoping for a profit. Answer B: you’ve had the things you sell for quite a while. Question 6. Are you running a business selling similar things? Answer A: the things you sell are related to your own trade or business. Answer B: the things you sell are not things you would sell in your own trade or business. Question 7. How did you pay for the things you’re selling? Answer A: you had to borrow money to pay for the things you’re selling. Answer B: you were given them or you paid for them out of your normal living expenses. Question 8. If you make the things you sell, do you charge more than they cost you to make? Answer A: you try to sell them at a price that covers your costs and brings in a profit. Answer B: you sell things that you make as a hobby and you only want to cover your costs. It would be fair to assume this lays out the criteria they are using to decide who is carrying out a trade and should be paying taxes and who is selling off unwanted stuff around the house. How will they find offending traders? HMRC have previously said that they will be using eBay records and comparing them to their own records to identify those that they believe are running a business. They haven’t said exactly how this will be done but presumably it won’t be too difficult to identify those that sell a high volume of goods if eBay is cooperating. Normally when HMRC runs this sort of campaign they offer an amnesty of sorts to let people come forward voluntarily. They are yet to provide full details of how it will work in this case but the chances are you will be given the opportunity to work out how much tax you owe and pay it without any penalty. You may also want to take this opportunity to really start thinking of yourself as a business owner and formalise your accounting arrangements. At Caprica Online we offer a great service to eBay traders helping them to set up KashFlow software which can then be easily intergrated with your paypal account. Follow the link below for more details. To the surprise of many Reading has recently been named the fifth best ‘European City of the Future’ in a 2012/13 report by fDi Intelligence (a division of the Financial Times). This is of course despite Reading still not currently being recognised as a City, though that could potentially change in the near future. It puts Reading behind London, Paris, Vienna and Moscow – natural peers. All this is even more impressive given that Reading is classed by fDi as a micro city due to having a population of less than 250,000. I moved to Reading just over six years ago following a job offer. At the time I was amazed by the number of top technology companies that choose to base their EMEA (Europe, Middle East & Africa) headquarters here. I’ve no doubt this has been a key driver in creating a thriving economy where smaller firms start up to provide services to the local behemoths like Microsoft, Oracle and Verizon. It all works to create a virtuous circle. I expect car drivers are a bit miffed by the infrastructure claims but the rail links with London are excellent (albeit ‘popular’) and surely can only get better with the current renovations train station renovations going on.